Hollington United Football Club’s first team reached a cup final for the second time in a fortnight. 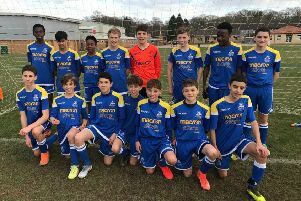 The Sussex Intermediate Challenge Cup finalists booked their place in the Mid Sussex Senior Charity Cup decider with a 2-0 semi-final win away to Lindfield on Saturday. Lindfield, who are just behind Hollington in the Mid Sussex League Premier Division’s top four, started the better and had the Lions on the back foot for the first 10 minutes, albeit without really creating anything. Hollington had the ball in the home net when Sean Ray headed home a Dominic Clarke cross, but the linesman had curiously flagged for offside. With the Lions having withstood the initial onslaught, they finally started to find their feet and took a deserved half time lead when good work from Jan Bailey and Allan McMinigal set up Clarke to volley home. The second period was a very similar story, with the hosts having a real go early on but the Lions defending superbly and dealing with everything thrown at them. The storm was again weathered and Hollington took control, with Alan Foster, McMinigal and Bailey all coming close. The second goal did come on 76 minutes - and a goal of the season it was too. Jay Tomlin slipped in Bailey down the right and he beat two players before chipping the goalkeeper from a tight angle 25 yards out, right in front of the impressive travelling support. Clarke was unlucky not to make it 3-0 when he hit the post, but it was another terrific win for the Lions and another cup final to look forward to. Man of the match, sponsored by 1066 Logos, was Clarke. Hollington manager Scott Price said: “We were very impressive today. The pitch was as bad as it gets and they were a very big, organised and aggressive side who know how to play the pitch. I can see how they’ve won the league for the past two years. “They were very direct and put the ball in the box at every opportunity, they even put the ball in the box from a throw-in on the halfway line. But we dealt with it really really well. “Again we had to adjust our game and once again we found a way to win. I thought every single play either matched or won their battles today. The players put a proper shift in today and in the end two bits of quality scored us the goals. Hollington will face Charlwood in the final on a date to be announced after the Championship leaders beat Southern Combination League Division Two high-flyers Copthorne in the other semi-final.